With charming farm-animal art on both sides, it's fun to practice lacing and tracing skills! This terrific wooden set from Melissa & Doug contains five sturdy double-sided lacing panels - featuring a cow, a rooster, a sheep, and more - and five color-coordinated laces. 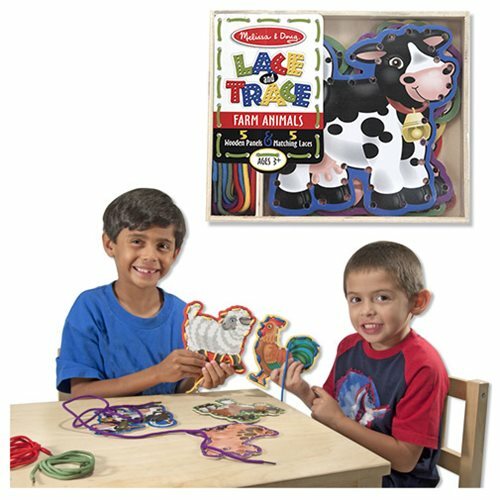 Develop hand-eye coordination and attention skills with Lace and Trace Farm Animals! Measures about 8 1/4-inches wide x 7-inches tall x 1 1/4-inches thick. Ages 3 and up.